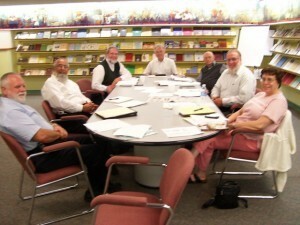 The Brethren World Assembly Planning Committee met at the Brethren Heritage Center in Brookville, Ohio, on September 12, 2011, to continue planning for its next event, scheduled for July 18-21, 2013. With the theme Brethren Spirituality, the event will be held at the Brethren Heritage Center, Brookville. Ohio. Those in attendance for the planning session were: Gary Kocheiser, Conservative Grace Brethren; Milton Cook, Dunkard Brethren; Jeff Bach, Church of the Brethren; Robert Alley, Church of the Brethren; Tom Julien, Fellowship of Grace Brethren; Mike Miller, Old German Baptist Brethren-New Conference and Brenda Colijn, Brethren Church. The Brethren World Assembly, held every five years, is a function of the Brethren Encyclopedia Committee. In 2008 The Brethren World Assembly was held in Schwarzenau Germany to celebrate the 300th anniversary of the founding of the Brethren.